North Korea's first nuclear test was conducted underground on 9 October 2006. The device was plutonium-fueled and the estimated yield was 0.2-1 kiloton. It is likely that this was a test of an improved implosion device small enough for delivery by one of North Korea's ballistic missile systems, although possibilities implying either higher or lower weapon capabilities cannot be excluded. It is also likely that the test failed to achieve the expected yield, which was reportedly 4 kilotons; such a failure could result from several factors and is not necessarily indicative of North Korea's weapon capabilities. If the test was indeed a failure, a second nuclear test is likely. On 9 October 2006 North Korea conducted its first nuclear test. North Korea had announced on 4 October their intent to conduct a test, and also notified the People's Republic of China 20 minutes before the test. The test was conducted underground (as have all nuclear tests by the other nuclear states since 1980). This is the first known nuclear test by any nation since the underground tests by India and Pakistan in May 1998. As a demonstration of North Korea's ability and intent to produce nuclear weapons, the test should not be a surprise. Various sources estimate that North Korea first obtained separated plutonium in quantities sufficient for a few nuclear weapons by 1992 to 1994. Separation of plutonium from spent fuel at the Yongbyon site resumed in 2003, following North Korea's withdrawal from the Nuclear Non-Proliferation Treaty. In July 2005 North Korea declared that it had produced nuclear weapons. As of mid-2006 the ISIS estimated that North Korea had produced 43 to 61 kg of plutonium, of which they estimated 20 to 53 kg had been separated. This would be sufficient for 4 to 13 nuclear weapons, by ISIS estimates. The Nodong missile could carry a 1,000 kg nuclear weapon to 1,500 km, sufficient to cover all of Japan. The Taepo Dong 1 could carry 750 kg to 2,300 km. North Korea recently developed missiles based on the Soviet R-27 (SS-N-6) SLBM: a road-mobile land-based version, already deployed, with a range of 3,500 km, sufficient to reach Guam; and a sea-based version with a range of 2,500 km. The original Soviet R-27 carried a payload of 650 kg; the payload of the North Korean versions are unknown but likely similar. The Taepo Dong 2 has been tested to a range of 6,000 km, sufficient to reach Alaska, but could probably only carry about 300 kg to this distance. North Korea could probably produce nuclear warheads light enough for the Nodong and Taepo Dong 1 and possibly the R-27, but not for the Taepo Dong 2 at full range. North Korea has supplied many of these missiles and components to Iran and Pakistan. The USGS reported the event took place at 41.294° N, 129.134° E (with a horizontal uncertainty of 9.6 km) at 01:35:27 UTC (10:35:27 AM local time). As of 16 October the USGS earthquake data base lists the location as 41.29° N, 129.09° E and time as 01:35:28.01 UTC. A possible test site in preparation was previously identified at 41.278° N, 129.089° W, about 1.5 km from the USGS location; ISIS has posted recent satellite imagery of this site. GlobalSecurity.org reports construction of a tunnel at this location, P'unggye-yok, to a depth of 700 meters. Use of horizontal tunnels for nuclear tests facilitates the use of diagnostic tests to help validate a nuclear weapon design. It is not known if the 9 October test was conducted here, or if this site is available for a future test. Reports on 17 October suggest that North Korea is preparing for a second nuclear test, although North Korea recently stated they do not plan to conduct another nuclear test. The location of the 9 October test is shown as a red dot in the NASA satellite image above (image from 1 May 2003); the larger red circle indicates the uncertainty in the USGS location. 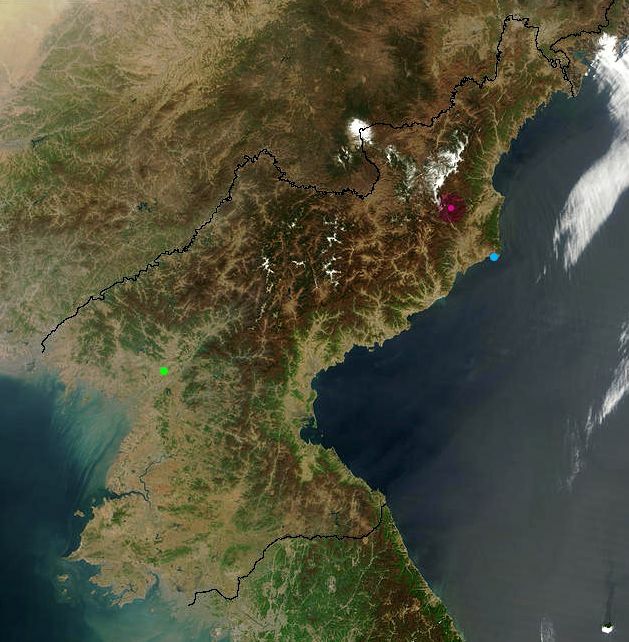 The green dot indicates the Yongbyon nuclear facility (at 39.797° N, 125.756° E); the light blue dot indicates the Musudan-ri test site (40.854° N, 129.668° E), used for Taepo Dong theater missile tests. North Korea reportly told the People's Republic of China that the expected yield was 4 kt, and subsequently issued a statement that the test was completely successful. South Korea reported a seismic magnitude of 3.58 to 3.7, later revised to 3.9, from which they estimate the yield as 0.45-0.55 to 0.8 kilotons (kt). France has given a yield estimate of 0.5 to 1 kt. The Japan Meteorological Agency reported a magnitude of 4.9, while the Japan Institute of Seismology and Volcanology gave a magnitude of 4.4 and also gave yield estimates of 0.5-3.0 kt or 0.25 kt. The USGS reports a seismic magnitude of 4.2. Following analysis of radioactive debris detected on 11 October, the U.S. Office of the Director of National Intelligence stated that the yield was less than 1 kt. News accounts have cited government sources as indicating that the yield was estimated at about 0.2 kt. Jane's Defence Weekly estimated a yield of 2 to 12 kt based on the USGS magnitude estimate. This yield estimate would be consistent with the yield-to-magnitude range for tests at the U.S. Nevada Test Site. Tests in the contrasting geological conditions of the Soviet Semipalatinsk site, however, might give a magnitude of 4.2 for a 0.5 kt yield. Science journal gave a yield estimate of 1-2 kt, and Nature journal estimated of 0.5-1 kt for a detonation in the presumed geological conditions (hard rock), or 10 kt for a detonation in soft rock (poorer coupling of shock to ground). Garwin and von Hippel summarize several yield estimates, including 0.5 to 2 kt and 0.2 to 0.7 kt (0.4 best estimate). The best current estimate of the yield of the 9 October test is in the 0.2-1 kt range. Further analysis may be able to improve on reported estimates, but lacking open information from North Korea uncertainty in the yield is likely to remain. The figure below plots estimated yield versus seismic magnitude for a variety of historical underground tests for which data is available; the blue box indicates the possible yield (0.2-1 kt) and magnitude (3.9-4.4) of the 9 October test. Some sources had expressed doubt that the explosion was nuclear, given the low yield estimates. Such claims were laid to rest on 15 October with reports that the U.S. had successfully detected radioactive effluents from the test. Additional confirmation may be possible from further analysis of the seismic signal; nuclear and conventional explosions can often be distinguished based on seismic signals, although this is sometimes impossible for low yield events. Regarding the initial disagreement, the Center for Nonproliferation Studies commented "Conclusive results of diagnostic tests should be available within days, but considering the potential risks in bluffing about nuclear capabilities, North Korean claims should be assumed to be true until conclusively proven false." This more cautious position has merits over the position of some analysts who have attempted to extrapolate this to an insubstantial North Korean nuclear capability. The claimed ambiguity regarding whether a nuclear test took place is ironic, given the confidence expressed that international monitoring of the Comprehensive Test Ban Treaty would be able to detect nuclear tests of this size. North Korea may have tested a basic implosion device, with an expected yield of 10-30 kt. A yield in the 1 kt range would indicate deficiencies in the design. Some news reports cited a Russian source as claiming that the device to be tested was a 4,000-kg device with an expected yield of 20 kt. These reports are uncorroborated; North Korea does not have a missile capable of delivering such a device. This explanation is unlikely. North Korea's nuclear research capabilities, combined with information available in the unclassified domain, should permit a reasonably high confidence in a basic implosion design (even one significantly smaller than 4,000-kg). Such confidence is perhaps part of the reason that North Korea did not test a weapon years earlier. The test may have been of a basic implosion device, but using less than a full load of fissile material. Such a test would still permit validation of the implosion design, but require less of North Korea's limited supply of fissile material. Cochran and Paine of the NRDC have estimated that the 61-year-old U.S. Fat Man implosion design could have yielded 0.5 to 1 kt using 2.5 to 3 kg of plutonium, as opposed to the 6 kg it actually used (The Amount of Plutonium and Highly-Enriched Uranium Needed for Pure Fission Nuclear Weapons, 1995). They also estimate a medium technical capability could achieve a 1 kt yield using only 1.5 kg of plutonium. Were North Korea to build such weapons, their stockpile of fissile material would be sufficient for 7 to 35 nuclear weapons. The test may have been of a low yield tactical-type warhead. Such a weapon may be designed to be more compact/light-weight and/or use less fissile material. The test then may have achieved design yield. One news report cites an unnamed source in Beijing as claiming that the test was of an enhanced radiation warhead (for which 0.5-5 kt would be a reasonable yield), but this claim cannot be corroborated and is unlikely for a first test. The test may have been of a more sophisticated design, such as one employing some fusion principles. This is unlikely for a first test, but cannot be ruled out. A kiloton-range yield could represent a failure, or it could represent a device intended as low yield (as in the case of an enhanced radiation warhead as mentioned above). Carey Sublette notes that IAEA analysis of North Korean plutonium in 1992 showed it to be high grade (97.56% Pu-239). If the plutonium used in the 9 October test were of such quality, preignition in an implosion design is unlikely. (It remains possible that the plutonium used was a lower grade, since most of the presumed North Korean plutonium stockpile was processed since 2003.) Sublette suggests that poor performance of the implosion system, late neutron initiation, or "some test-related technical fault in an otherwise sound design" could account for a reduced yield. GlobalSecurity.org cites reports suggesting that North Korea participated in one of the Pakistani nuclear tests of 1998. This is based on reports that one of the tests, isolated from the others (possibly for security reasons) used plutonium; Pakistan is believed to have had insufficient indigenous plutonium for a test at this time. If true, such cooperation may have facilitated North Korean confidence in conducting a test at less than full yield. It is not clear from the U.S. announced yield estimate if this eliminates the possibility of measures by the North Koreans to decouple the test shock. If a low-yield nuclear test is conducted in an excavated cavity, the shock wave can be partially decoupled from the ground, resulting in a lower apparent yield to seimic monitors. However, there is no reported indication that the North Koreans engaged in such measures, which would likely involve observable excavation activities. A test designed to be of low yield would also have the advantage of being easier to fully contain underground. This would deny other nations the ability to assess the nature of the weapon design based on detection of radioactive by-products. On 13 October reports emerged that a U.S. WC-135 aircraft sent to the region to detect and analyze radiological effluents had failed to detect radioactivity. Some analysts quickly cited this in favor of their hypothesis that the 9 October event was non-nuclear. Such claims were proven premature with the 16 October announcement of detection on 11 October of radioactive debris from the test. In summary, it is unlikely that North Korea was testing a basic implosion nuclear device, as in the first nuclear tests by most nuclear weapons states. More likely, the test was a reduced yield version of an improved implosion design, possibly one suitable for delivery by one or more North Korean missile systems. If so, the test is more comparable to tests first conducted by the United States in 1952 than to the first U.S. test in 1945. The possibility of a test geared towards second-generation principles, e.g. incorporating fusion reactions, cannot be eliminated but is unlikely. Assuming an intended yield of 4 kt and an actual yield of ~0.5 kt, North Korea has likely acquired significant information towards correcting any design problems associated with the reduced yield. Some media reports (including reports by The New York Times) have ascribed significance to the fact that the test was of a plutonium-fueled device rather than a uranium-fueled device. As background, some critics have doubted claims that North Korea is pursuing uranium enrichment. During the Clinton administration, U.S. intelligence had identified evidence that North Korea was pursuing uranium enrichment. Mounting evidence during the Bush administration prompted the U.S. to confront North Korea on the issue in 2002. In October 2002, the U.S. announced that North Korea acknowledged in one-on-one talks that it was pursuing a uranium enrichment program for nuclear weapons, leading to suspension of fuel oil shipments to North Korea. When confronted by the IAEA on the issue, North Korea declined to address the claims regarding uranium enrichment, which would be a violation of treaty obligations; instead, North Korea announced its withdrawal from the Nuclear Non-Proliferation Treaty in January 2003 and began separation of plutonium from fuel formerly safeguarded by the IAEA. The uranium enrichment program, if efforts have continued, is unlikely to have produced sufficient highly enriched uranium (HEU) for a nuclear device at this time. Most of the North Korean fissile material stockpile is believed to be plutonium processed since 2003. Analysts both inside and outside the arms control community have expressed widely varying interpretations of the 9 October event and its meaning for North Korean nuclear capabilities. Basic nuclear weapons design is not sufficiently challenging to dismiss the North Korean nuclear threat, however, and the world community must consider seriously this event given North Korea's record on WMD production and on arms exports. © 2006 by Wm. Robert Johnston. Last modified 21 October 2006. Return to Home. Return to Nuclear Weapons.